The yacht has four double cabins, one cabin with bunk beds all with en suite facilities. Antonis was born and lives in Athens and he is 34 years old. He has graduated from T.E.D. of Western Macedoniain Department of Public Relation & Communication but his passion for sea made him change his career path and follow the Marine industry. 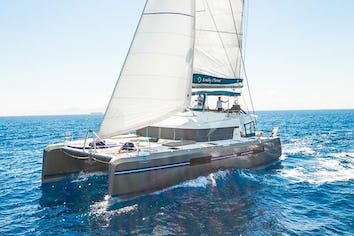 He is a qualified skipper holding a RYA Yacht master Offshore Sailing and Motor up to 200gt. His character allows him to be able to deal with any situation at sea, and he is very responsible in his job. He is not only serious but also he is an amusing person able to communicate well as it is also his field of study, and to fulfill all expectations of his clients. He speaks fluent English and some Italian. When he is not on board he likes to travel, sail, kite surfing and getting involved with everything that has to do with the sea environment. Maria was born in Athens. She studied graphic design art and worked in fashion industry in Greece and South Africa for many years. She discovered her love for the sea when she start her sailing lessons. 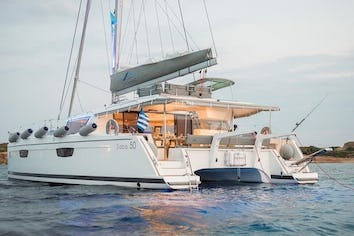 Since then she combines her love for sailing and passion for cooking and spend all her spare and working time in the sea as a chef/hostess on different charter boats as well as private. 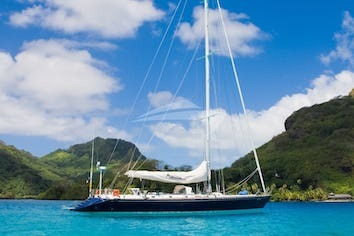 She has sailed all over Greece, the Mediterranean and has crossed the South Pacific Ocean. She loves cooking and since she has very creative personality, she adores discovering new plates and flavors....but she has a secret love...desserts!!! So, get ready! Besides her two loves of her life, sailing and cooking, she likes photography and yoga, Pilates and pole dancing. She speaks fluent Greek/English and basic French/Italian.